Hallahan’s exhibition, we, takes it’s title from the book by Yevgeny Zamyatin published in 1924. The Zamyatin story is set in a world where the population is separated from the natural world by a green wall and citizens are given numbers instead of names. Structure and order are considered the only way of life. Zamyatin’s book is a precursor to Aldous Huxley’s Brave New World, published in 1932 and George Orwell’s 1984, published in 1949. Hallahan’s works pose questions about humankind’s connection to the natural world. The earth is an ever-changing ecosystem and environment and how humans relate to it in the future will define how life for humankind and all other species will be lived in the short-term, medium-term and long-term future. The exhibition is made up of a number of large paintings, sculpture, video and a series of watercolours all looking to natural forms and ideas. In 2018 he was awarded the Golden Fleece Award. Paul Hallahan’s artwork is primarily based in painting and sculpture taking formalistic ideas from the past and assigning them into today’s world, to ask what art can do. His interests are varied but commonly look at how we as humans engage and interact with nature beyond ourselves, both individually and societally. How being part of nature effects humanities perception of ourselves and in a world that has a growing interest in the systems we have built, such as computers and networks ahead of our natural world, and how we as humans see a future on an individual level. He is curious about how we see and interact with what is titled art and how this can affect us within the primordial parts of our brains. Hallahan has always had an interest in how art can transcend the verbal and written languages we use. 21 November, 5.30pm: Ashford in Conversation, Paul Hallahan with Exhibitions Curator, Ruth Carroll. Hallahan has exhibited both nationally and internationally. Between 2009 and 2012 he founded Soma Contemporary in Waterford City. Alongside his own art practice he has curated various projects and events and his work is included in Waterford City, OPW and private collections. The RHA Ashford Gallery Programme is Sponsored by Hennessy. 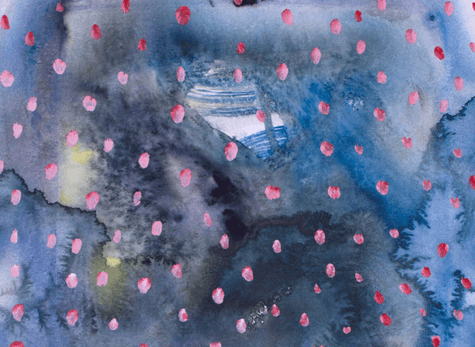 Image: Paul Hallahan, Aimlessly Pretty (1) 206 (detail), 2015, Watercolour on HP Fabriano paper, 36cm x 28cm, Image courtesy of the artist.